In the introduction to the recipe for Roman patina with asparagus and quail I wrote about this dish. 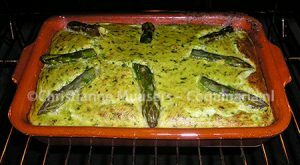 On this page is another recipe for patina with asparagus, without meat but with green herbs. I also used green asparagus this time. The cilantro and lovage leaves add a very distinct flavour to this patina. The lovages can be replaced by lovage seeds, if so desired. 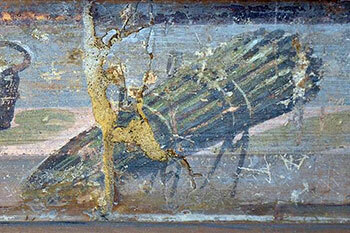 Roman fresco’s mostly depict green asparagus, not white ones. Green and white asparagus are from the same plant, but the cultivation of white asparagus dates from after the Roman era. My use of white asparagus in the patina is quail is an anachronism. The season for fresh white asparagus is short: from mid-April to the 24th of June (Saint John’s) the white stalks that are harvested have grown outdoors. Asparagus is not white by its own choice. If you leave them alone the stalks will peep out above the soil and turn green in the sunlight. Nowadays you can buy green asparagus all year round. In my opinion you can’t exchange white asparagus for green and vice versa in whatever recipe you want to prepare, they each have their own flavour. It is not impossible to use green or white asparagus for the same recipe, but the finished dish will be quite different. 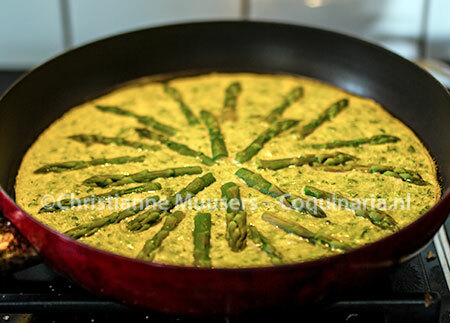 In the recipe below you can use both white or green asparagus, depending on availability and preference. Just remember: canned asparagus are NOT an option! Put in a mortar the trimmings of asparagus which are thrown away, pound them, pour on wine and strain them. Pound pepper, lovage, green coriander, savory, onion, wine, liquamen and oil. Pour the liquor into a greased dish and if you want stir eggs in over the fire so that it thickens, sprinkle with ground pepper. 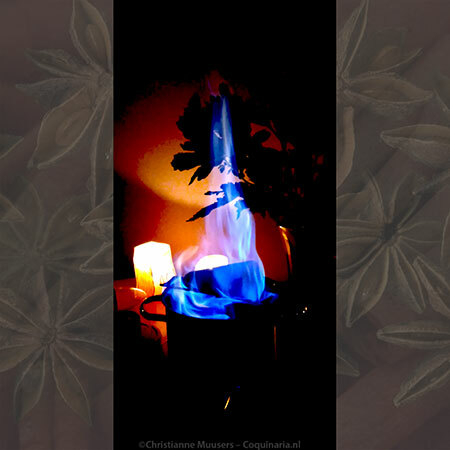 According to Grocock and Grainger the asparagorum praecisuras are not the tips of asparagus, but the discarded fibrous ends of asparagus, that we now use for making soup of asparagus. This recipe then would be a kind of leftover recipe. Although they may very well be right (because of “proiciuntur”), I followed Flower and Rosenbaum (and Faas) because I liked the combination of green herbs with green asparagus tips more. 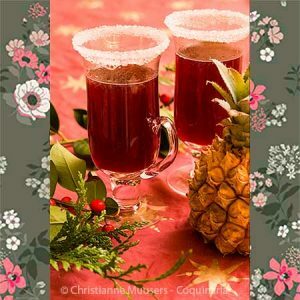 First course or side dish for 6 to 12 persons; preparation in advance 15 minuten; preparation 30 minutes. Rinse the green asparagus, do not peel them. Cut off the tips with 5 cm/2 inches extra. Also cut 1 cm or ½inch off the other end, discard them. Blanch the stalks for two minutes in salted water, remove them and then blanch the tips also two minutes. Keep the asparagus tips separately for decorating the patina. Heat olive oil in a small frying pan and fry the onion until transparent. Let is cool slightly. Chop the herbs. Put the asparagus stalks in the blender or mortar and purée them with the herbs, wine and pepper. Temper with the stirred eggs, garum and fried onion. Preheat the oven to 200 °C/390 °F. Grease an oven dish with olive oil, pour in the mixed eggs. Arrange the asparagus tips on them (they will sink a little into the eggs but that is no problem), and cover the dish with aluminium foil. Place the dish in the centre of the oven and remove the aluminium foil after 15 minutes. After another 15 minutes, check whether the patina has set by inserting a wooden tooth pick. If that comes out dry, the patina is ready. It is also possible to simply prepare this patina as an omelette in a frying pan on the stove. Warm or at room temperature, as first course or side dish. Many Roman recipes for patina (a kind of omelette or custard) contain meat, but not this one. Using salt instead of garum makes it suitable for vegetarians.